A local graduate student is the lucky winner in an Acme Markets sweepstakes game. 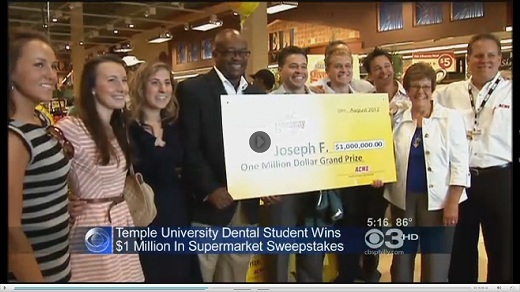 Joseph Facciolo, a 26-year-old dental student at Temple University, is a winner in the Acme Summer Sizzlin’ Sweepstakes. He won at a Bala Cynwyd supermarket. Facciolo’s prize is a thirty-year, $1 million annuity (cash value about $800,000), but says that with taxes on his prize estimated at 35 percent, plus dental school loans of over $300,000, a million dollars isn’t as much as it sounds like. A federal judge has ended a lawsuit over poor dental care in California prisons, saying that conditions have improved in the seven years since the suit was filed. Corrections Secretary Matthew Cate praised the decision Wednesday as another sign of progress in the troubled prison system. U.S. District Court Judge Jeffrey White of San Francisco dismissed the case on Monday at the request of attorneys representing the state and inmates. "A comprehensive system is now in place to ensure that inmate-patients receive constitutionally adequate dental care," the order says. Some remaining renovation work should be done by May 2014, according to the Department of Corrections and Rehabilitation. Inspections of dental programs at all 33 adult prisons were completed in June. The department said the programs passed with an average grade of more than 98 percent. Exposure to high levels of fluoride in drinking water may harm children's neurodevelopment, according to a systematic review and metaanalysis of published studies. Philippe Grandjean, MD, PhD, of the Department of Environmental Health, Harvard School of Public Health, Boston, Massachusetts, and colleagues found that children living in highly fluoridated areas had significantly lower IQ scores than their peers living in areas of low fluoridation. "The results suggest that fluoride may be a developmental neurotoxicant that affects brain development at exposures much below those that can cause toxicity in adults," they write. The study was published online July 20 in Environmental Health Perspectives. A mother's emotional health and education level during her child's earliest years influence oral health at age 14, according to a new study from Case Western Reserve University's School of Dental Medicine. It was found that mothers with more education beyond high school, with healthy emotional states and knowledge about eating right had children with healthier teeth. "We cannot ignore these environmental influences and need interventions to help some moms get on track early in their children's lives," Nelson concludes. Nelson says moms need to care for themselves to help their children. She likens it to the emergency instructions on an airplane that mothers put on the mask first and then their children. "How can a mother help her child if she passes out," asks Nelson. "It's all common sense, but some mothers may need help."